an evolving strategy for disease prevention and tailored treatment that incorporates individual genetic, environmental, and experiential variability. Unlike the current system of medicine that provides treatments for disease consequences, precision medicine focuses on true disease etiology. Antman et al. believe that health care under precision medicine will become an integrated and dynamic system, which will make patients become central stakeholders that provide data and participate actively in shared decision making. Apart from the considerable variation seen within country respect to age, race, ethnicity and geographical location that leads to the necessary of precision medicine, many advances occurred in several areas of medicine that enabled precision medicine. Disease etiology is related to the determinants of individual cases (sick individuals) and the determinants of incidence rates (sick populations). As Geoffrey Rose proposed in 1986, the priority should be to discover and control the causes of incidence. Building on Geoffrey Rose’s therapy, the goal of precision medicine should be to shift the median in the population from right towards left. These six factors interact with each other, producing a dynamic state. In the end of the lecture, Dr. Antman mentioned that seeing the number of facts per medical decision panicked him until he saw a paper that investigated the cognitive consequences of having information at our fingertips in our heavily computerized environment. 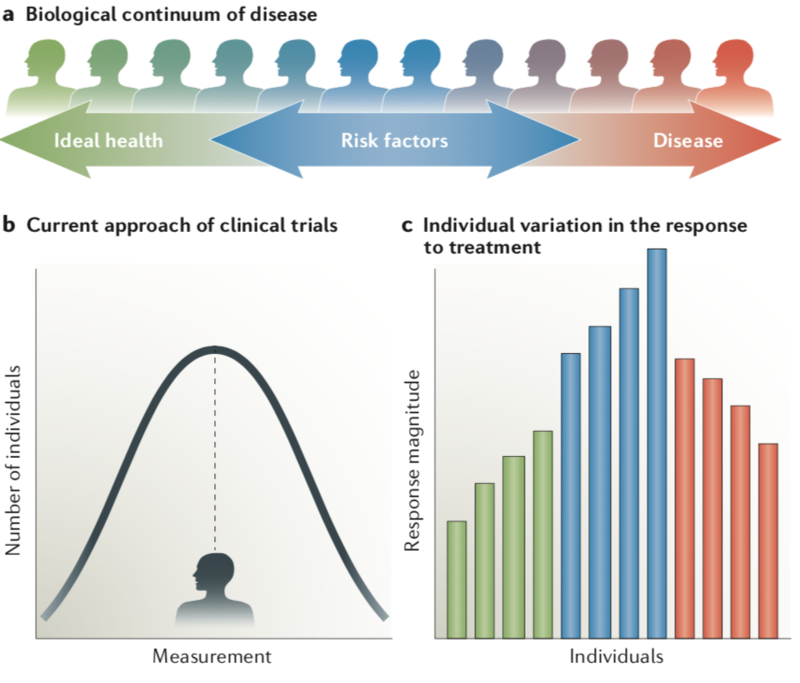 The predictive enrichment strategy under precision medicine utilizes both the participant data obtained either from pre-trial experiments or during the trial (adaptive design) to ‘predict’ which participants are likely to have a more robust response to the treatment(s) being tested. Thus, Antman et al. point out that biomarkers that predict a clinical end point might ultimately constitute a validated surrogate end point for a clinical trial. A methodologic innovation responsive to the need of recruiting patients with rare genetic subtypes of a disease for the evaluation of targeted therapy involves coordinated efforts to evaluate more than one or two treatments in more than one patient type or disease within the same overall trial structure. Such efforts are referred to as master protocols, defined as one overarching protocol designed to answer multiple questions. 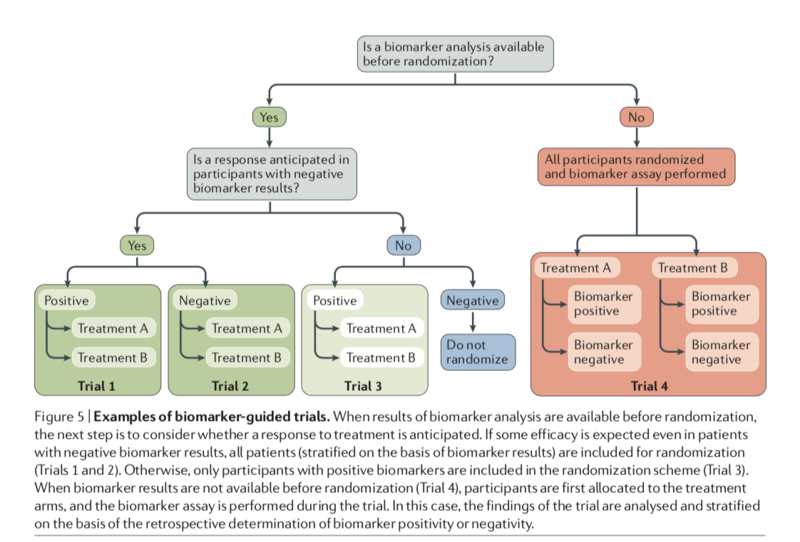 Master protocols may involve one or more interventions in multiple diseases or a single disease, as defined by current disease classification, with multiple interventions, each targeting a particular biomarker-defined population or disease subtype. Included under this broad definition of a master protocol are three distinct entities: umbrella, basket, and platform trials. Johnson et al. 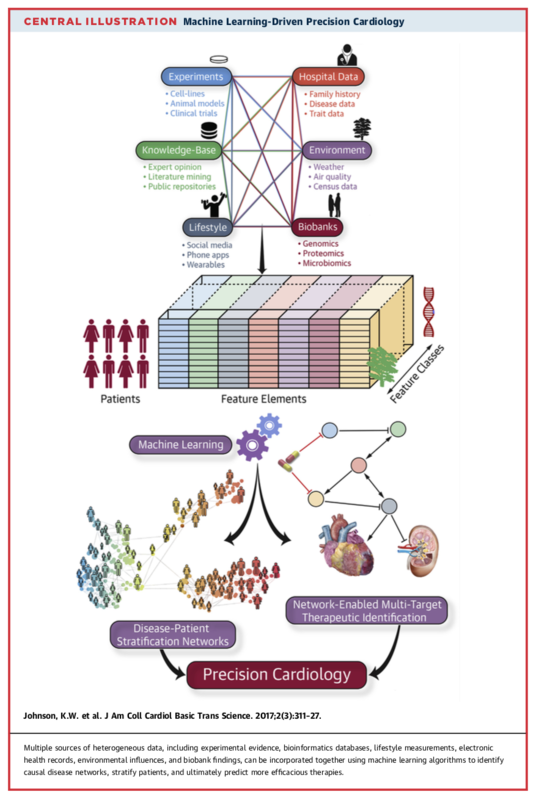 in their paper Enabling precision cardiology through multiscale biology and systems medicine described the utilization of machine learning in processing multidimensional data.